UTRGV family medicine residents and first-year medical students participated recently in Operation Lone Star at PSJA High School in San Juan. The annual emergency preparedness event ran from July 23-27, offering public health care services for South Texas communities, including physicals, sports physicals, immunizations and screenings for diabetes, blood pressure and vision. The Texas Department of State Health Services runs the weeklong exercise, in partnership with the Texas State Guard Medical Brigade and local health departments. Family medicine residents and first-year medical students from The University of Texas Rio Grande Valley participated recently in Operation Lone Star at Pharr-San Juan-Alamo High School. Operation Lone Star, which ran from July 23-27, is an annual emergency preparedness event that offers public health care services for South Texas communities, including physicals, sports physicals, immunizations and screenings for diabetes, blood pressure and vision. Some locations also offered eye and dental exams. Medical residents from the UTRGV School of Medicine’s three Family Medicine residency programs provided health care services to patients, and medical students observed and assisted healthcare providers on Wednesday, July 25, and Thursday, July 26. Participating in Operation Lone Star offers the School of Medicine another opportunity to fulfill its mission to engage with the community, expand access to health care services and provide excellent care to patients. 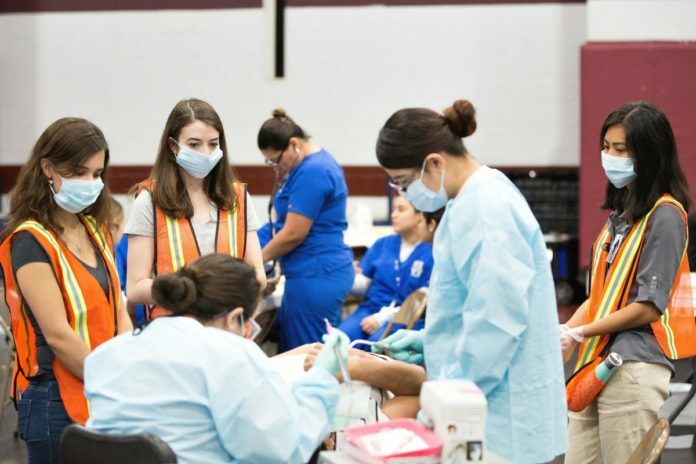 The Texas Department of State Health Services runs the weeklong exercise in partnership with the Texas State Guard Medical Brigade and local health departments. This year, Operation Lone Star conducted the exercises in six locations throughout Cameron, Hidalgo, Starr and Webb counties.